1. Gov.Perry upheld the decision of the Texas Board of Pardons and Parole Rules to grant clemency to death row inmate Kenneth Foster--a man about to be executed for a murder he didn't commit. I'd like to see Gov. Perry lead an effort to re-evaluate Texas' penal code--which is clearly one of the most barbaric in the world. 2. Gov. Perry praised Mexican workers--including the undocumented, criticized the U.S. Congress for failing to pass immigration legislation and asked American politicians to cut the mean talk and grow up. And he said these things while abroad in Mexico! In these two instances, Gov. 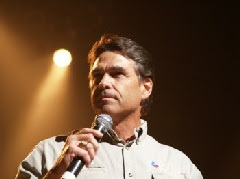 Perry has exhibited greater leadership and vision than has been demonstrated by the Republicans currently on the national stage. My bet is that these moves--especially his pro-immigrant stance--will actually be a huge political plus going forward. SAN JUAN, Puerto Rico (David McFadden, AP - 8.25.07) - A call by Puerto Rico's [Governor Anibal Acevedo] for a U.S. withdrawal from Iraq earned a standing ovation Saturday from a conference of more than 4,000 National Guardsmen. Acevedo said sending more troops to Iraq would be a costly blunder. ''By increasing the number of National Guard and reserve troops, we put our soldiers in danger for the umpteenth time since the beginning of the global war on terrorism,'' said the governor, adding U.S. territories and states need Guard reserves in the event of natural disasters and domestic disturbances. Col. David Carrion Baralt, the Guard's top official in the U.S. Caribbean territory, said Acevedo received a standing ovation. The nonpartisan National Guard Association represents nearly 45,000 current and former Air and Army National Guard officers. Emma Lozano spoke to the media last week about Elvira Arellano's deportation after leaving her church sanctuary. Ms Lozano is Church Council President of Adalberto United Methodist Church, founder of Pueblo Sin Fronteras and 'Madrina' to Elvira Arellano's Saulito. She's also the sister of Rudy Lozano, Chicago union organizer and community activist who was murdered June 8, 1983. Click here for Maria Hinojosa's interview of Ms Lozano; and here for a Los Angeles City Beat interview. Eduardo Porter writes (Mexico’s Plutocracy Thrives on Robber-Baron Concessions, NYTimes - 8.27.07) that "[g]rowing up in Mexico City, I always knew Mexico was an unjust country — a place where small coteries of the privileged control all power and wealth while half the population lives in poverty. He says, it "...never occurred to me that Mexico would have billionaires." It does. According to Forbes magazine, last year there were 10 Mexicans among the world’s billionaires--with Carlos Slim as the world's richest. In 1990, the government of President Carlos Salinas de Gortari sold his friend Mr. Slim the Mexican national phone company, Telmex, along with a de facto commitment to maintain its monopoly for years. Then it awarded Telmex the only nationwide cellphone license. Not only does Slim (and his class) own a larger share of the local economy than has ever been the case with America's own super rich, but he's even less philanthropic. Porter cautions that America is on the road towards it's own Mexican-like rich-poor divide. My view is that U.S.--and global--immigration policies must be: 1) humane towards the displaced workers; and 2) tough on the ruling classes which have rigged all of the rules in their favor. Also, see Slim's the Richest (but at whose expense?). In a short three minute statement, Alberto Gonzalez, America's first Latino Attorney General, announced his much anticipated resignation effective September 17, 2007. He thanked the staff of the Justice Department for their work and he said that serving as the nation's Attorney General had been a high privilege. He added that "we live in the greatest country in the world," and that he has "lived the American Dream." Alluding to the problems besetting his tenure as AG--and to his modest beginnings, he said that even in the most troubling of times he enjoyed a life that was substantially better than what his parents were afforded. The office of the Attorney General has been the leading force for implementing many of President Bush/VP Cheney's controversial policies. As such, political opponents first demanded John Ashcroft's resignation--and then Gonzalez'. Upon taking many arrows on behalf of the administration, charges of politically motivated firings of 8 Justice Department attorneys by Gonzalez were near fatal. Gonzales' resignation is 4th high-profile departure from President George W. Bush's presidency in less than year, following former Defense Secretary Donald Rumsfeld; his former deputy Paul Wolfowitz stepped down as president of the World Bank; and top Bush adviser Karl Rove earlier this month announced he was stepping down. Louis Gerard Mendoza is on a journey only a few hardy souls would ever attempt: he's traveling to all four corners American on his bike. 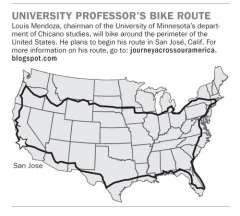 A scholar and head of Chicano Studies at the University of Minnesota in Minneapolis, Dr. Mendoza is riding to see and record the "Latinoization" of America. From July-December 2007 I'll be biking across the U.S. This experience will be the basis for book that follows José Martí’s 1891 call in "Our America" for a distinctively American culture, o ne that embraces rather than denies, the dynamic and organic relationship between place, language, and experience that shapes the American continent. In the blog I'll document the exchanges I have with people about the Latinoization of the U.S. as well as my own life experiences and thoughts. My plan from here is to go south to Iowa City and visit friends who have alerted me to local tensions arising in nearby communities related to immigration. From there I will go towards Milwaukee, down to Chicago and then across to Detroit and into Ontario, Canada where I will cross back into the U.S. at Niagara Falls. From there I will head east through New York, Massachusetts and began a southward trek along the eastern seaboard. It's a fascinating journey of discovery for Dr. Mendoza and readers of his Journey Across America weblog. In addition to blog entries, Dr. Mendoza is capturing video of his trip. Here's his up close look at a majestic Buffalo near Yellowstone Park. Buffalo on road in Yellowstone from Louis Mendoza and Vimeo. Michael Scherer (Barack Obama's Republican edge, Salon - 8.24.07) examines a little noticed or understood aspect of Barack Obama's candidacy: his appeal to Republicans. A University of Iowa survey of Republican preference for president found that Romney #1, Rudy #2 and Obama #3. Focus group guru Frank Luntz found that Republicans prefer Obama over Hillary and Edwards combined. And a WaPo-ABC poll found that Republicans and Independents were more likely than Democrats to prefer Obama over Hillary. 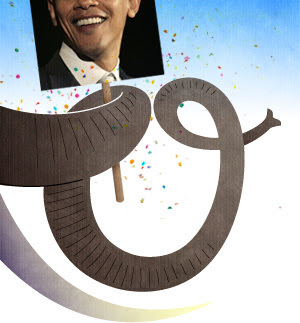 What is Obama's attraction for Republicans? A growing number of Republicans are simply tired of the nastiness of American politics today. And they see the polarizing tactics/personalities of the current crop of Republicans and Democrats as offering more of the same--except for Obama. Of course, support from disaffected Republicans doesn't help Obama in his quest to win more Democratic Party primary votes than his rivals. It would, however, do him well in the Fall of '08 as the Democratic nominee. It's not as though there aren't sensible Republicans warning the GOP that nativist appeals aren't just wrong for America--ever, but deadly in the long term for the offending political party. GOP Chairman Mel Martinez, Clint Bollick and Linda Chavez are three that come to mind. In Native Sons: The political perils of targeting immigrants (Wall Street Journal - 8.24.07), Kimberly A. Strassel does a terrific job of connecting an earlier form of bigotry referred to as "Romanism", to today's equally vile anti-immigration sentiments. Strassel sees parallels between the attacks on Irish and Italian Catholics of an earlier time with attacks on Latinos today. Republicans paid a mighty price for their foolishness back then. Unbelievably, it appears that they have come back for more. Native Sons: The political perils of targeting immigrants. History students call it a teaching moment: A week before the general election in 1884, fiery Protestant minister Samuel D. Burchard warned about the perils of allowing his party to identify with "Romanism." Standing by his side in New York was Republican presidential candidate James G. Blaine. Catholic voters were furious. Mr. Blaine lost the state by 1,149 votes, and the election to Grover Cleveland. It then took Catholics 100 years to get over it, when Ronald Reagan finally convinced them to trust his party again. Today's question is whether Mitt Romney and Rudy Giuliani are providing future scholars with their own teaching moment. Their spitting row over illegal immigration continues to lead the news, given how little else there has been to fill the newspapers in these dreary August days. At its current momentum, it also threatens to become a case study in how nativism can drive a political party off a cliff. Two hundred or so protesters gathered outside NYC Department of Education Monday evening in support of the Khalil Gibran International Academy. The group — a mix of students, parents, teachers and activists from a wide range of organizations — blamed Mayor Michael R. Bloomberg and Chancellor Joel I. Klein for the school’s struggles, saying they did not do enough to help the founding principal, Debbie Almontaser. Update: Through the magic of YouTube and bloggers like NewsHound, I just watched yesterday's entire Geraldo Rivera vs Tom Tancredo segment. You can watch it, too, here and here. Ellen of NewsHound and others believe Rivera got the better of Tancredo in the exchange. I'm still not sure about that. Yes, Rivera brought up good and reasoned arguments, but this issue--and the rest of the whole immigration debate--has little to nothing to do about who has the most well thought out argument. It's about the rightwing using very dirty and dishonest tactics in order to distract and divide Americans. And, as long as Americans are open to rightwing appeals to bigotry and racism, the Tancredos, Romneys and Hannitys of the world prevail. An important question for Americans in the run-up to the 2008 election is: Do they even want an honest and intelligent discussion on immigration, or do prefer an issue that allows them and the nation to spew racism? So far, it looks like preference is for the latter. But there's a ways to go until November of 2008 with plenty of opportunity for the emergence of a statesman or two. We'll see. I'm watching an incredible game between two of baseball's best teams: the New York Yankees and the Los Angeles Angels. These ball teams hail from cities which the nation will soon come to know as leading "Sanctuary" cities. During a commercial I decide to see what the anti-Latino/immigrant topic of the night is on TalkCable. I click on Fox and there's Tom Tancredo battling Geraldo Rivera on Hannity & Colmes. The topic: the Newark slayings and immigration. Rivera/Colmes are trying to make the point that it's wrong to blame all undocumented immigrants for the crimes of a few. Tancredo/Hannity are blaming Newark and other so-called "sanctuary" cities for refusing to collaborate with federal authorities in identifying and jailing undocumented residents. By keeping the conversation focused on the horrific slayings in Newark, Tancredo/Hannity kept Rivera on the defensive, so much so that by the end Rivera predicts that "Sanctuary Cities" will be the seminal issue of the 2008 presidential elections. Meanwhile, Tancredo is totally in his element making the rightwing case against sanctuary cities. After all, Tancredo has been a staunch critic of pro-immigrant and Sanctuary cities for years. I agree with Rivera that Sanctuary Cities will emerge as a major political issue this campaign season. It's already being used to tag Republican Rudy Giuliani as a liberal on the immigration issue. But more importantly, the issue will be used to paint the Democrat presidential nominee--Hillary--as weak on border security AND crime. Sanctuary Cities as the Willie Horton of 2008? Tom Tancredo noted today that the rest of the GOP presidential contenders are sounding an awful lot like him these days on immigration. Of course, Tancredo's right. They are NOW all for being super harsh to immigrants--especially those pesky Mexican laborers Americans love to employ. Being the nativist leader that he is, Tancredo is moving on to bigger game. He's now focusing his attention back on those U.S. cities--Miami, New York, LA, et al--that he has maligned over the years as "third world." Tancredo now wants the federal government to punish these meccas of immigration for adopting humane policies. BTW: Tancredo's nickname is "Tank." Apropos, because he is the German Panzer of American politics. Of course, the ever versatile Mitt Romney has begun airing commercials of his own with a very Tancreodian message: Force the mayors and council members of so-called "Sanctuary" cities to adopt anti-immigrant codes or lose federal funding. Funny, Romney never bothered Bedford, Boston, Cambridge, Lawrence, Lowell, Provincetown, Springfield, or any of those other "immigrant-friendly" cities in Massachusetts. But I digress. So, I ask the GOP rightwingers again: Why settle for a Romney when you can have Tancredo? L.A. Law actress Michele Greene. New Mexico Governor – and presidential candidate – Bill Richardson. What do these individuals have in common? Their American-sounding last names – and their Latino cultural heritage. I call them "Latinos incognitos," because at first glance, they might not easily be recognized as Hispanic. With Anglo fathers and Latina mothers, the institution of marriage automatically hid the Latino heritage of all these individuals – at least on paper. As a result, they certainly don’t “sound” Latino. They may not even “look” Latino, either. So are they really Latinos? Because of his name and his part-Anglo heritage, Bill Richardson has been accused of being “not Latino enough.” But at the same time, he is also accused of being “too Latino,” trying to leverage his Hispanic heritage for political gain. The reality, of course, is that Bill Richardson is Latino, and he is Anglo. The two cultures are not mutually exclusive – although they are often treated as such. When was the last time you saw a box for “multicultural” on any official form? Our society does not easily accept the middle ground between two heritages. On official forms, as in life, bicultural Latinos are pressured to choose. And inevitably, they will receive criticism for their choices. Kevin Johnson (another Latino incognito), in his memoir, How Did You Get to Be Mexican?, recalls being accused in college of “checking the box” as a Latino to get preferential treatment, but not being “Latino enough” to back it up with political activism. Even Latinos with two Latino parents can have their Latinidad challenged. A dear friend of mine, who proudly describes herself as Puerto Rican, was often made to feel less so by her native Puerto Rican peers in New Jersey, because she wasn’t “born on the island.” Another friend who doesn't "look" Latina recalls that the only way she could convince her Hispanic classmates that she was indeed Latina was to tell them she watched Walter Mercado's horoscopes with her grandmother. But who is a Latino, anyway? Is it someone who is born in this country, a descendant of the original Spanish settlers? Is a Latino someone whose family immigrated from a Spanish-speaking country and created a home here? Can you be a Latino without a Hispanic name? Without speaking Spanish? Without a direct connection to your heritage? What makes someone a Latino? It’s certainly not just the name, despite the U.S. Census’ original method of counting Latinos by using the category “Hispanic surname.” Where does that leave Governor Bill Richardson or Michele Greene (who, as a bilingual singer/songwriter, recently released her second CD in both English and Spanish)? 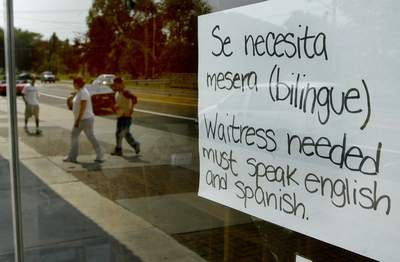 Language helps – but you don’t even have to speak Spanish to be a Latino (and a growing number of Latinos don’t). The reverse, however, can be true – you can start to feel Latino just by speaking Spanish. There is something in the sound of the language, the words themselves, that bring Latinidad to those who choose to celebrate its beauty, its richness, and its innate poetry. Those who learn Spanish in order to bark orders at employees or simply to fulfill a foreign language requirement are not likely to feel it, though. Here, intention is everything. Being a Latino is more than just a language or a last name, or even what country you came from or can trace your roots to. Being a Latino is about a feeling, an attitude, a connection to life and culture and family and music, and a desire to experience it all to its fullest. Being a Latino means living life with sabor, and taking the time to appreciate and enjoy everything – and everyone – that makes life worth living. And we can all use a little bit of that Latinidad. Some people talk about immigration in terms of politics, some in terms of history. But the crux of the matter is numbers. The Labor Department says that immigrants make up about 15 percent of the work force. It's estimated that a third of those are undocumented workers, or what those who want to send them back to where they came from call "illegals." The Pew Hispanic Center estimates that one in four farmhands in the United States is an undocumented immigrant, and that they make up a significant portion of the people who build our houses, clean our office buildings and prepare our food. All the thundering about policing the border and rounding up those who have slipped over it ignores an inconvenient fact: America has become a nation dependent on the presence of newcomers, both those with green cards and those without. Mayor Michael Bloomberg of New York testified before a Senate committee that they are a linchpin of his city's economy. The current and former chairmen of the Federal Reserve have favored legal accommodations for undocumented workers because of their salutary effect on economic growth—and the downturn that could follow their departure. Business leaders say agriculture, construction, meatpacking and other industries would collapse without them. Last year the town of Hazleton, Pa., became known for the most draconian immigration laws in the country, laws making English the official city language, levying harsh fines against landlords who rent to undocumented immigrants and revoking the business permit of anyone who employs them. There was a lot of public talk about crime and gangs and very little about hard work in local factories and new businesses along the formerly moribund Wyoming Street. In that atmosphere, those with apartments to let and jobs to fill could be excused if they avoided any supplicant with an accent. Oh, the mayor and his supporters insisted that the laws were meant only to deal with those here illegally, but the net effect was to make all Latinos feel unwelcome. When the law was struck down by a federal judge, there was rejoicing among Hazleton's immigrants, but some said an exodus had already begun. Longtime residents seemed to think that was just fine. This is part of a great historical continuum—the Germans once derided the Irish, and the Irish trashed the Italians—but it is a shortsighted approach. Economists say immigrants buying starter homes will keep the bottom from falling out of the housing market in the years ahead. Latinos are opening new businesses at a rate three times faster than the national average. If undocumented immigrants were driven out of the work force, there would be a domino effect: prices of things ranging from peaches to plastering would rise. Nursing homes would be understaffed. Hotel rooms wouldn't get cleaned. Sure, it would be great if everyone were here legally, if the immigration service weren't such a disaster that getting a green card is a life's work. It would be great if other nations had economies robust enough to support their citizens so leaving home wasn't the only answer. But at a certain point public policy means dealing not only with how things ought to be but with how they are. Here's how they are: these people work the jobs we don't want, sometimes two and three jobs at a time. They do it on the cheap, which is tough, so that their children won't have to, which is good. They use services like hospitals and schools, which is a drain on public coffers, and they pay taxes, which contribute to them. Immigration is never about today, always about tomorrow, an exercise in that thing some native-born Americans seem to have lost the knack for: deferred gratification. It's the young woman in New York City who splits family translation duties with her two siblings. Her parents showed extraordinary courage in leaving all that was familiar and coming to a place where they couldn't even read the street signs. Does it matter if they don't speak English when they have children who aced the SAT verbal section and were educated in the Ivy League? It's the educated man who arrived in the Washington, D.C., area and took a job doing landscaping, then found work as a painter, then was hired to fix up an entire apartment complex by someone who liked his work ethic. He started his own business and wound up employing others. Does it matter that he arrived in this country with no work visa if he is now bolstering the nation's economy? The city of Hazleton says yes. And if towns like Hazleton, whose aging populations were on the wane before the immigrants arrived, succeed in driving newcomers away, those who remain will find themselves surrounded by empty storefronts, deserted restaurants and houses that will not sell. It's the civic equivalent of starving to death because you don't care for the food. But at least everyone involved can tell themselves their town wasted away while they were speaking English. 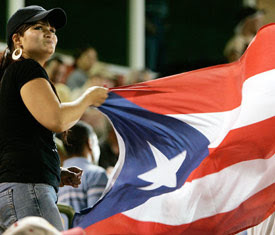 After 69 years in existence, the Puerto Rico Winter League cancelled its upcoming season because of financial problems. Fortunately, Major League Baseball may step in and salvage part of Puerto Rico's sports heritage by sponsoring an alternative winter season league. "I'm very concerned there is no baseball in Puerto Rico. I'm disappointed, because Puerto Rico has a culture and a history of playing the game. Second, we use the league as a developmental tool, and that will not be available now. We are not happy about it. The fans are not very happy about it. We have to put our heads together, between MLB and Puerto Rico and the Players Association, and keep baseball alive in some shape or form." 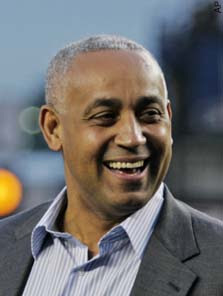 Lou Melendez, MLB VP-International Baseball Operations. Sadly, Winter league's demise is in keeping with the sad state-of-affairs in Puerto Rico. On the one hand, Puerto Rico has been eclipsed by the Dominican Republic, Venezuela and Mexico as Meccas of Latin baseball--each sponsoring very popular Winter leagues of their own. On the other hand, island leaders failed in their duties to market Puerto Rico as a quality venue for a sport that generates billions of dollars and has a huge Latin, North American and international fan base. As in so many other examples, island leaders continue to fail Puerto Rico. Immigration debate gets angrier: Groups loudly press for state, local crackdowns. 1) Former House Speaker Newt Gingrich and stealth Republican presidential candidate recently declared "a war here at home" against illegal immigration, which he says is as important as the US-Iraq War. 2) "Even though immigration is always unsettling and somewhat controversial, we haven't had this kind of intensity and widespread, deep-seated anger for almost 100 years," said Doris Meissner, a senior fellow with the Migration Policy Institute and former commissioner of the U.S. Immigration and Naturalization Service. 3) The Alabama-based Southern Poverty Law Center, which monitors hate groups, said the number of "nativist extremist" organizations advocating against illegal immigration has grown from virtually zero just over five years ago to 144, including groups such as the Ku Klux Klan and Aryan supremacists. 4) Eighty-three percent of immigrants from Mexico and 79 percent of immigrants from Central America believe there is growing discrimination against Latin American immigrants in the United States, according to a poll conducted by Miami-based Bendixen & Associates. 5) As prospects for congressional action appeared increasingly in doubt this year, all 50 states and more than 75 towns and cities considered -- and in many cases enacted -- immigration restrictions, even though initial court rulings have declared such actions unconstitutional intrusions on federal responsibilities. Chicago Tribune photo by Abel Uribe (8.19.07): Elvira Arellano meets with news media at Our Lady Queen of Angels church in downtown Los Angeles on Sunday just prior to her arrest a few blocks away. Click here for an 11 photo documentary of Elvira and Saul's fateful trip to Los Angeles. ELVIRA'S SONG was written in support of Elvira Arellano and her son Saul by neighbors of Elvira’s former Humboldt Park sanctuary Adalberto United Methodist Church. As musicians, they chose to lend their voices to her crusade. Elvira, under threat of deportation, had taken refuge to avoid separating from her son Saul, who is a U.S. citizen. Sadly, she was arrested by ICE yesterday and deported. Click here for a recording of Elvira's Song. I’m just a single working mother and I need this. Do you think you wouldn’t do the same? D.) There is no D! The AP is reporting that Elvira was arrested Sunday outside Our Lady Queen of Angels Roman Catholic Church in Los Angeles and deported. "She has been deported. 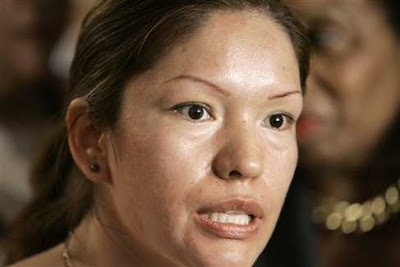 She is free and in Tijuana," said Rev. Walter Coleman, pastor of Adalberto United Methodist Church in Chicago, where Arellano had been living. "She is in good spirits. She is ready to continue the struggle against the separation of families from the other side of the border." Elvira's 8 year old son Saul--an American citizen--was left under the care of the Pastor Coleman and his wife. Clearly, the U.S. government--and its rightwingers--wanted to silence Elvira. While they have unlimited propaganda capacity, a single undocumented woman, the mother of a U.S. citizen, operating without resources and out of a storefront church in Chicago, was too much of a challenge. For these people, the maid should always keep her mouth shut. I can see the screechers and haters patting themselves on the back as they boast about taking down Elvira. What a splendid victory. What a trophy. Q: Have they truly silenced Elvira? She is now free to take her story to the world. Given all that the U.S. has chosen to represent to the peoples of the world, Elvira's story will now confirm. Tragedies have a way of bringing people together. We've seen people put aside their differences--even if only temporarily--in response to a natural or man made disaster. The government's response is a different matter, but the people come together to pitch in, volunteer, donate, send encouraging messages and even to grieve. Black, White, Brown--it doesn't matter. For brief moments they're all brothers and sisters coming together to help. It seems that the six trapped coal miners inside the Crandall Canyon Mine is the most recent example of this humanitarian impulse. For two weeks rescuers have literally moved mountains in an effort reach the miners--with two men dying in the dangerous and heroic bid. The families from different backgrounds have huddled together, hoping for good news--grief etched on their faces even as they tried valiantly to appear strong for their friends, families and the nation. And the nation's attention has been riveted on the Utah mine, the rescue effort, and the hope that somehow ALL six men would emerge alive. What's interesting about this whole unfortunate incident is that I've heard no one even mention that half of the trapped miners are Latino. Not once. It's clear if you look at the faces of the family members and read the names, but it's irrelevant to the narrative and to most Americans--whom are decent people. And the rightwing radio screechers have not yet attempted to malign the Latino miners or their families. Perhaps they will. But for now, in this incident, America is standing tall. 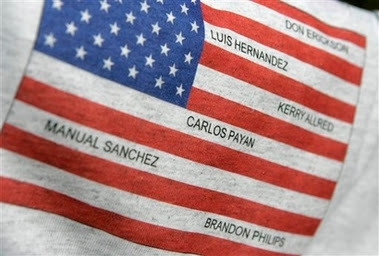 Brandon, Carlos, Don, Kerry, Luis and Manual are America's miners. Yes, the Latinization of America continues. This time the focus is on Orange County in New York. Yes, the Orange County of American Chopper and West Point fame. Perennially rated as one of America's most attractive places to live, Orange County is bordered to the North by the Catskills, the Hudson River to the East, New York's Rockland County to the South East, New Jersey's rural Sussex County to the South, and rural Northeastern Pennsylvania to the West. The latest population estimates by the Census Bureau show that the Orange County (NY) Latino population surged to around 15.4% (58,000) of the county's 376,000 residents--an increase from 11.6% in 2000. "You have a lot of Hispanics that are coming here from New York City, Westchester and New Jersey, not unlike other groups," said [Jose] DeJesus, a native of Puerto Rico whose family moved to Walden from Yonkers in 1992. "They're looking for good communities, they're looking for good places for their children." Read Orange County attracts minorities: Hispanic surge leads the way, Times Herald-Record - 8.17.07. NO WAY OUT (by Don Terry, Chicago-Tribune - 8.5.07) is a moving account of Elvira Arellano's life in sanctuary in the aftermath of the rightwing's victory over immigration reform. The article begins with Elvira waving a small Puerto Rican flag as she watches the local Puerto Rican Day parade from within the Adalberto Church. In a sign of Latino solidarity, Elvira's son, Saul, marches as an honorary grand marshall. Shamefully, the spirit of solidarity is punctured by the profound ignorance and hate of someone the article describes as a Puerto Rican woman. Pathetically, this woman screeches out the ever popular "go home" racist taunt. Nonetheless, there are wonderful and poignant moments in Elvira's story--examples of the human spirit rising above the pathetic constraints of the debased and the faithless. Beti Guevara, the assistant pastor at Adalberto, holding onto Saul's hand jumps on a bench and leads the crowd in a passionate chant in Spanish, "Puerto Ricans and Mexicans fighting hand in hand!" Arellano and Saul's food and clothes are mostly donated by friends and strangers, like the man in Vermont who sends a check for $7 each week. Elvira's only escape is to step-out onto the tiny fenced-in and blacktopped space behind the church. It's where two long, wooden planters where peppers, avocados, mint and tomatoes grow in what she calls "a garden of hope." Elvira lights charcoal and incense in a conch shell and a bowl she calls a Poposhcome, waving the smoke into her face. It's an ancient Aztec ritual in which she asks her ancestors and the Great Creator for energy and strength and wisdom to continue her fight. Finally--and for me the most moving, a delegation of African-American ministers gathered around Elvira in prayer, placing their hands on her bowed head. She said, "At that moment I felt very protected." The humanity and faithfulness of that image is very profound--and filled with hope. Click here for an account of Elvira's story in her own words. THEY RULE BASEBALL AND THE BODEGA INDUSTRY but Dominican brilliance doesn't end there. It shows itself in politics, fashion, music, television, literature and, most recently, Hollywood. From Washington Heights to SoHo and from Shea to Santo Domingo, here is Tempo's annual list of Quisqueya's brightest lights in the city. Trinidad Sánchez, Jr.--or Trino as he was fondly called--was a special person. An educator, poet and peaceful warrior for justice, Trino touched souls and ignited imaginations. Trino died unexpectedly last year after a stroke. He was 63 years old. And as if to put an exclamation point on America's current period of shame, Trino suffered without health insurance. Among other works, Trino published two collections of poetry: Why Am I So Brown, and Jalapeño Blues. A friend of his in life and in spirit sent me what is perhaps Trino's final poem--an anguished cry against the madness and hypocrisy of the anti-Latino racism of people like of Tom Tancredo. 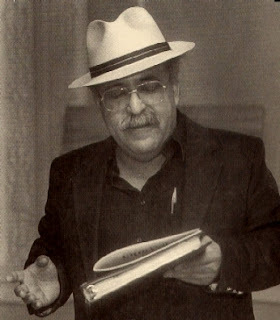 For a glimpse of the man, read the trinity of posts on Trino by Ruth of La Tertulia. there would be an abundance of justicia! maid your houses, garden your flowers. your kind refuses to do. we are all proud of being Illegal Americans. if there are skeletons in your closet . . .
need to be extra careful. I’m proud of being Illegal. that you look for . . .
in color and size and even better than you. there are only Illegal governments. writing this poem is Illegal. because it’s the fashionable thing to be. I know how to be! Today's Washington Post article, Recruiting For Iraq War Undercut in Puerto Rico, reports on how the island's Independentistas are effectively campaigning against school-based recruitment for the Iraq War--and, in the process, renewing themselves as a political force. Unbelievably, President Bush's education act, No Child Left Behind, includes a provision allowing U.S. military officials to directly recruit 16, 17 and 18 year olds enrolled in high schools receiving federal aid. Since the schools targeted for the federal aid enroll the bulk of the nation's disadvantaged and children of color, military recruiters have disproportionate access to such children, including almost all of Puerto Rico's high schoolers. However, the law does contain an 'opt out' clause. That is, a parent wanting to keep military recruiters away from their child can do so by completing an 'opt out' form. As you can imagine, it's a right few parents of disadvantaged high schoolers know about. However, the Independentista Party of Puerto Rico, in alliance with Madres Contra La Guerra (Mothers Against War), have made it their business to inform parents of Puerto Rico's highschoolers of this right and to encourage them to opt out. The result thus far is that the U.S. War Recruiters are officially barred from soliciting 57%, or 65,000, of the island's 10th, 11th and 12th gradeers. The Independentistas are mining a rich vein of discontent as fully 75% Puerto Rico's residents are now opposed to the US-Iraq War. 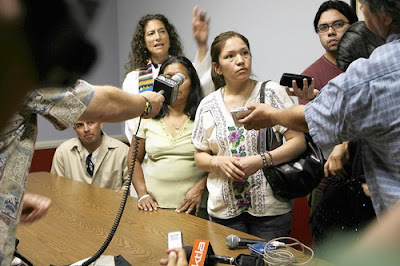 Elvira Arellano, an immigrant activist and international symbol for the just treatment of migrants, will leave her Chicago church sanctuary on September 12, 2007. Elvira Arellano travel to Washington, DC where she will join supporters in fasting and praying for a humane and just solution to the situation of immigrant families. For a year, Ms Arellano and her U.S. Citizen son, Saul, have been given sanctuary in the Adalberto United Methodist Church in Chicago's mostly Puerto Rican Humboldt Square neighborhood. Under the protection of the store front church and the community, Ms. Arellano, 32, an undocumented immigrant from Mexico, emerged as an international leader for the humane treatment of migrants. Arellano has become a crusader and a symbol of hope for migrant people seeking justice. Migrants seek changes in national policies that are out of sync with the needs of a globalizing world, and which punish the people most vulnerable to economic and political dislocation. Not only is this U.S. practice barbaric, but it denies U.S. citizen children of immigrants their constitutional rights. Ms. Arellano is aware that bad things can happen en route or while in Washington, DC. America and the world has a long history of human rights activists being taunted, imprisoned and even martyered. "If this government would separate me from my son, let them do it in front of the men and women who have the responsibility to fix this broken law and uphold the principles of human dignity." The world no doubt will be watching to see how the U.S. authorities, politicians, the media and the American people respond. Given the harsh rhetoric of the rightwing, xenophobic politicians, and racist Americans, the outcome may be a sad one. But the cause for the humane and just treatment of America's--and indeed, the world's--migrants will have only just begun. Tribal War Against the NYC Khalil Gibran Academy? After a year long campaign against a new public school offering instruction in the Arabic language and culture--the Khalil Gibran International Academy, a cabal of conservative public school critics, rightwing media and anti-Muslim agitators forced the resignation of Debbie Almonstaser, the new school's founding principal. Ms. Almontaser was forced to resign after she inadvertently gave the school's enemies an opening by giving the NYPost a politically incorrect definition of the loaded word "intifada". Instead of condemning the use of the word, Ms. Almontaser explained that tee-shirts for a Yemeni women's group featuring the offending word was an expression of liberation for women raised under repressive traditional cultures. Apparently, the word does also mean "to shake off". Regardless, it's use in any context for some in NYC is unacceptable and dangerous. 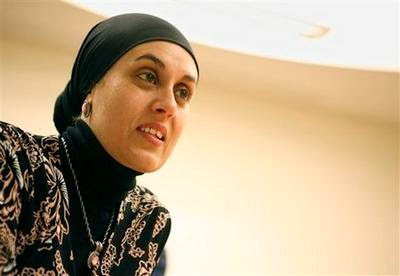 Ms Almontaser's explanation was viewed as supporting the connotation given the word by rebellious Palestinians fighting Israel in the West Bank and the Gaza Strip. Perhaps acknowledging the tribal aspect of the school's opposition, NYC public school officials quickly named Danielle Salzberg, an experienced educator of Jewish heritage, as the Almontaser's replacement. It's unclear if this move will work or if it'll lead to increased efforts to kill the school. Almost instantly the fire has been redirected to Ms Salzberg--and there's probably a whole lot more to come. Lost in the mix is the strange role of the NYC Department of Education, and its partner, New Visions for Public Schools. It appears that the DOE and New Visions have fallen down in their responsibility to adequately support a first-time principal and a school which everyone knew would be subject to deep hostilities. Additionally, why was Ms. Almontaser allowed to answer questions from a newspaper known to be hostile to the school and its founder? This is especially interesting since the DOE is known for tightly controlling media access to its staff members. It's clear that deep-seeded tribal hatred overpowered reason in the case of Debbie Almontaser and the Khalil Gibran International Academy. Almontaser tries to offer an educational option to help NYC students succeed and she gets the boot for an unfortunate linguistic/political faux pa. Meanwhile, all sorts of excuses are offered for why DOE incompetents and even criminals can not be fired. This is tribal politics at its worse. Republicans, who just a few short years ago were trying to court Latino voters, are going to come to regret the anti-immigration one-upmanship they've exhibited in the primary campaign. No one knows you like I do. Nobody can know your heart the way I do. No one can testify for all that you've been through, but I will. I was born in Puerto Rico. Spanish, Caribbean in my soul. Hearts of sunshine in the cold. Born in Puerto Rico was written by Paul Simon for The Capeman. Click here for the full lyrics. Hillary Clinton has truly emerged as the candidate to beat. Aided by the mistakes by her opponents, steady--if uninspiring--debate performances, and a lift from Bill as "Salesman-in-Chief", Hillary has secured and lengthened her lead. The promising Barak Obama, crusading John Edwards, likable Bill Richardson, nor any of the others appear to have enough to stop her march to nomination. As a result, Hillary seems more relaxed in her role as leading candidate and her "pro-people" message is getting through. Watch her first Iowa commercial in which she calmly and convincingly manages to: relate to average Iowans, while offering a devastating critique the Bush administration's social policies. What's also interesting is that the ad is effective in making the claim that Hillary--and, therefore, not Edwards and Obama--is the true agent of change for the little guy. Nonetheless, Edwards and Obama's challenge is now much greater. It's now not good enough to be the anti-Hillary; Democrats are comfortable with her as their standard bearer. Edwards, Obama and possible candidate Al Gore must now prove that he offers the party the best chance to 1) win the presidency and 2) enact a very pro-Democratic party agenda. A very high standard. Unless something extraordinary happens to change the political context, the Democratic Party table appears set. Stamford - More than 50 people huddled around afire yesterday in the mammoth teepee, with smoke venting through a latticework of logs lashed at the top. It was 3 p.m., time for the sacred talking circle. Only members of the American Indian tribes gathered for a journey were permitted inside. They're reclaiming their identity as Native Americans, and they're reclaiming their mental health as a people and as individuals, too. There were representatives from the Cree, Blackfoot, Six Nations of the Grand River, Mohawk, Cayuga, Oneida, Lakota and Taino Nation tribes. The teepee was on the Shady Lane property of Jerry and Jeannie Calcano McDonald, hosts to a delegation of dozens taking part in the Spirit of the Youth Unity Run. The Unity Run was started in 1986 in South Dakota by the Lakota tribe, she said. "The elders there had this recurring dream about reuniting the native people here," Freeman said. Their dreams were spurred by the 1890 Wounded Knee, S.D., massacre that left 300 Lakota men, women and children dead, she said. "With the loss and the death of those people, the Lakota lost their language and what made them a people," Freeman said. "So, they dreamt about reuniting their people. 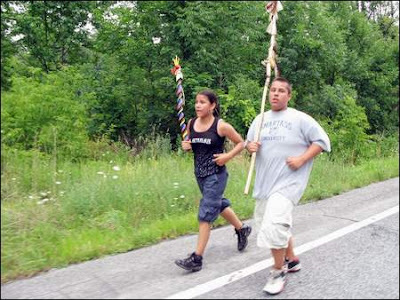 These unity runs are part of a revitalization of the Native American culture and identity. The imprisonment of persons of Japanese heritage during WWII was one of America's most shameful acts. Thousands of people lost their property and freedom simply because a white majority--led by racist politicians and radio broadcasters--decided to brutalize "aliens" in the name of "national security." While Americans would acknowledge that dispossessing and imprisoning people simply because of their race, or because they "may be" disloyal, is wrong on all levels, I'm not so sure that today's anti-immigrants share that view. Watch this U.S. propaganda film and see if you don't hear some of the same racist justifications used today to pass anti-immigrant housing and employment codes, imprison immigrants in "detention" centers, and racially profile immigrants. Also, listen for the smug claims of moral superiority. The narrator--sounding an awful lot like Patrick Buchanan--actually claims that the horrific treatment of Japanese Americans was "civilized" and "christian". Bloomberg on Immigrants: "Boy, Let 'em Come"
Bloomberg doesn't think much of Mitt Romney’s characterization of New York City as a “poster child” for illegal immigration, saying at a press conference in Manhattan this morning that the city, and country, “thrive” on immigrants. At an appearance in Iowa, Romney made a comment -- directed at Rudy Giuliani -- that the former mayor “instructed city workers not to provide information to the federal government that would allow them to enforce the law. New York City was the poster child for sanctuary cities in the country." According to New Scrutiny as Immigrants Die in Custody (NYTimes - 6.26.07), 62 immigrants to died while held in ICE prisons between 2004 and June of this year. And the deaths continue. Shockingly, no government body is charged with accounting for deaths of immigrants while under ICE imprisonment. 1. ICE arrested Edmar Alvez Araujo Tuesday, August 7th, at 3 p.m. ICE authorities denied him his medication. Araujo was dead at 4:18 p.m.
2. Early Wednesday morning, August 8th, Rosa Contreras Dominguez, a legal U.S. resident, died while being held in an ICE prison in EL Paso, Texas. She was pregnant. 3. Sandra M. Kenley died in a rural Virginia jail, where she had complained of not receiving medicine for high blood pressure. 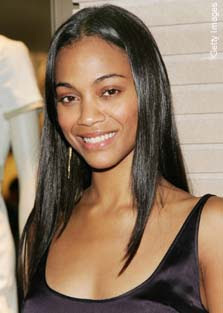 Kenley was a legal permanent resident of the United States for more than 30 years. 4. Young Sook Kim pleas for medical care were ignored by ICE officials at an Albuquerque ICE prison. She died Sept. 11, 2006--a day after she was taken to a hospital. 5. Abdoulai Sall, 50, a taxi cab mechanic in Washington died in an ICE prison December 2006. Sall was denied medication for a kidney ailment. SAN JUAN, Puerto Rico - Puerto Rican health authorities warned Wednesday that the potentially deadly disease dengue fever was reaching epidemic proportions and called for a territory-wide campaign to eliminate breeding grounds of disease-carrying mosquitoes. Enid Garcia-Rivera, the U.S. territory’s secretary of health and epidemiology, said 2,343 confirmed cases of dengue had been reported since the beginning of the year, more than double the number of cases reported in the same period last year and the most since the dengue epidemic of 1994. 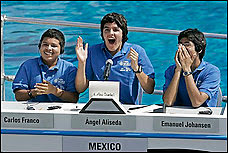 SAN DIEGO - (AP -8.10.07) A trio of Mexican teenagers won the eighth National Geographic World Championship on Thursday, dethroning the United States, a four-time champion. To win, they had to name the historic site that was carved from sandstone in 1200 B.C. and features two massive temples and statues of an ancient ruler. The teens nailed the answer - the Egyptian monument Abu Simbel. "To win gold, it's really great," said team member Emanuel Johansen Campos, 15, of Tejalpa, Mexico. "I don't have any words." The competition tests teenagers on geography, demographics and political history. Teams and individuals were asked to identify errors on maps, countries based on demographic statistics and the origin of tribal musical instruments and carved relics loaned by the San Diego Museum of Man. It was the first finals appearance for Mexico. Johansen was joined by Carlos Franco Ruiz, 14, of Zapotlan de Juarez, north of Mexico City, and team captain Angel Aliseda Alonso, 16, of Guadalajara. The county with the largest number of Latinos is Los Angeles County, California with 4,706,994, or almost half of all Angelenos. Houston's Harris County is second with 1,200,957, or 38% of that county's total. Although New York City's five county aggregate of 2,251,673 Latinos, or 28% of the total population, would rank it 2nd behind only Los Angeles County. More Than 300 Counties Now "Majority-Minority"
The two largest counties passing this threshold between July 1, 2005, and July 1, 2006, are Denver County, Colo., and East Baton Rouge Parish, La., with total populations of 566,974 and 429,073, respectively. Three other counties were in Texas (Winkler, Waller and Wharton), with one each in Montana (Blaine), New Mexico (Colfax) and Virginia (Manassas Park, an independent city and considered a county equivalent). Los Angeles County, Calif., had the largest minority population in the country in 2006. At 7 million, or 71 percent of its total, Los Angeles County is home to one in every 14 of the nation’s minority residents. Harris County, Texas, gained 121,400 minority residents between 2005 and 2006, which led the nation. Harris (Houston is its largest city) now has a minority population of 2.5 million, comprising 63 percent of its total. Its minority population ranks third nationally, not far behind second place Cook County, Ill. (Chicago). Based on total population, Starr County, Texas, located on the Mexican border, had the highest proportion of all counties that was minority, at 98 percent. Among the nation’s 25 most populous counties, Miami-Dade County, Fla., had the highest proportion minority, at 82 percent. We last reported that the "NO Deal Deal" had been struck and that Suffolk County Executive would get his $300 million sales tax in exchange for a hands-off policy in regards to any state-funded hiring hall. Assembly big shot Sheldon Silver promised that the required vote would take place in September when members return from vacation. Never one to leave things alone, the hyperactive Levy declares that he's being forced to cut $8.8 million from the county budget, including postponing the new police recruits class. Levy either doesn't trust his old colleague Sheldon Silver's word or he's simply taking the opportunity to squeeze the last bastion of resistance to his growing dictatorship. 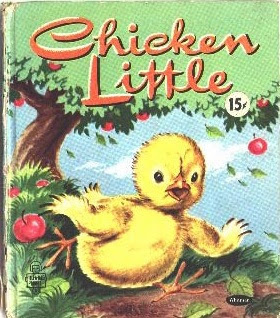 However, this recent act by Levy prompted Assemblyman Philip Ramos (D-Brentwood) to label him "Chicken Little" for claiming "the sky is falling." Of course, Chicken Little was right that the sky was falling in the recent movie. Well, not the sky but Alien Invaders. No wonder Levy is so obsessed with fighting aliens. See Levy won't wait for Silver's Sept. promise. Even though 40% of Carpentersville, Illinois' 37,000 residents are Latino, it has not stopped local politicians from running on anti-Latino platforms and winning. Gaining power by pitting Whites against Latinos, village trustees have enacted a series of employment and housing codes aimed at beating back the rising Latino population. Residents of Latino heritage--many which are long-time residents--are shocked and dismayed by the anti-Latino animus of the new village trustees and their supporters. Unfortunately, the racists appear to have won a short-term victory: American Latinos are leaving town. 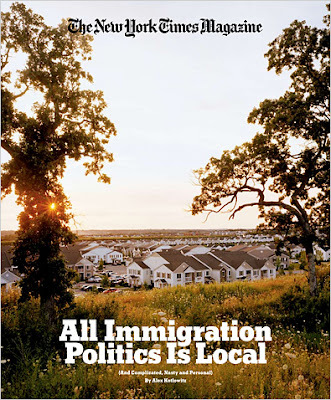 Also see PORTRAIT OF A SMALL TOWN'S WAR ON IMMIGRANTS by immigration attorney and blogger Greg Siskind. The official “Day of the Puerto Rican Indian” was inaugurated in a State Proclamation of the Interim Governor of the Commonwealth of Puerto Rico, the Hon. Fernando Chardón, on the 12th day of August 1970. 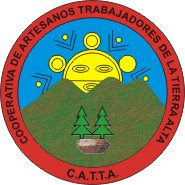 Recently, the autonomous municipality of Jayuya (Office of Tourism) in cooperation with local Taino represented by CATTA-COOP Inc. has celebrated this day with a weekend of special presentations and programs. This year’s event will take place on August 11 & 12, 2007 in Barrio Coaybey, Jayuya, Puerto Rico.